A little fire for your cold winter? Now days, when you want this achievement, you need to get thrown off Deathwing's back in the Dragon Soul raid. 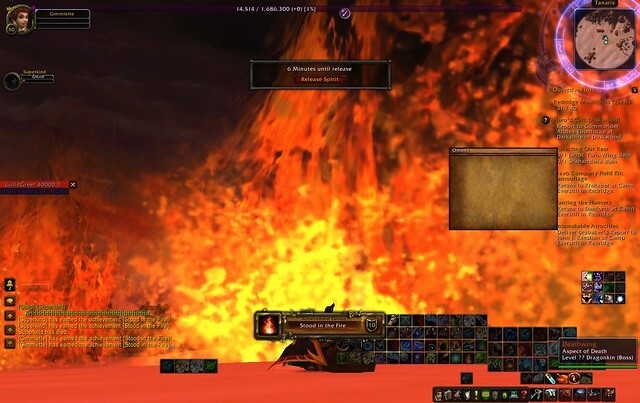 During the first half of Cataclysm, you got the achievement by being in the wrong place at the right time, or the right place at the wrong time, or something like that. Superkind (who no longer plays) and I were in Tanaris. We had gone to Zul'Farrak for something, I don't remember what. We were riding back to Gadgetzen. My screen suddenly got bright red. I thought my computer was having issues. Oh no! I couldn't afford a new computer at that time. Then, suddenly, all...this..fire and the huge shadowy form of a dragon flying overhead. Super and I were the first people in the guild to get toasted. In a way, I found that kind of fitting as we are the co-founders of Spectacular Death. The funny thing about getting toasted in or around Gadgetzen, if you were inside the buildings, the light changed but you would be safe as long as you didn't go outside until the effects subsided. It probably worked that way in other zones which Deathwing fried, but I know this for a fact as I was once at the then neutral Auction House in Gadgetzen when he showed up. I really liked this event and was sad when it was removed when the raid went live. We "live" in a world where anything can and will kill you. The randomness of this made questing, or, in my case, doing archeology, more dangerous. Was Deathwing going to fry me today? I wound up being toasted 5 times when he was in the world. Blizzard does these kind of events really well. I wish there were more of them.